You don't have to be a jerk to succeed in life, says Northeastern University professor David DeSteno in his new book. You don’t have to be a jerk to get ahead — in business and in life, according to David DeSteno, a Northeastern University psychology professor. Instead, positive emotions lead to bigger wins. 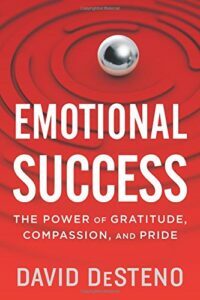 He spoke with Knowledge@Wharton about this concept, which he wrote about in his book — Emotional Success: The Power of Gratitude, Compassion, and Pride. His comments came during the Knowledge@Wharton show, which airs on SiriusXM channel 111. Knowledge@Wharton: Why did you hone in on these specific qualities of gratitude, compassion and pride? David DeSteno: We do a lot of work in my lab trying to understand how emotions affect social behavior and self control. If you read a lot of the bestsellers out there on how to have grit and succeed and persevere in the face of difficulties, the emotional side is kind of left out of it. We see in our lab and in our work that there are a lot of emotions that make us willing to sacrifice, not only to help other people but to help our future selves and to work hard. I wanted to explore that side of it. What I found is not only do these emotions give you grit, they give you grace. They help you build social relationships that give you a balanced success while you’re trying to pursue those goals that will help you get ahead in your career. Knowledge@Wharton: Take us into that relationship with grit. DeSteno: Grit is the passion to pursue your goals, to do something hard, to be willing to work hard to get ahead. Outside of the professional domain, I think about grit in the social domain. To me, people who have grit are the mom who might work three jobs to put her kid through college and the grandfather with emphysema who will pull the oxygen tank behind him to go see his grandson’s game. What drives that is not this kind of planning, this willpower, it’s what you feel. Emotions are a big source of that. We’ve been finding that these three emotions, which are intrinsically tied to social life, make people value their future goals and future rewards more. Because they do that, they’re an easy way to help you accept the sacrifices in the moment that are necessary to get there. Knowledge@Wharton: The concept of emotion where business is concerned has been viewed as a weakness. Are you saying that is definitely not the case? DeSteno: It’s not the case. If you look at the way people say you should have self-control and work hard, and study hard to persevere, it’s a lot about willpower and suppressing your emotions. There are emotions that make you want to throw in the towel or find the easy way out, but there are other emotions that make you value the future. If you think about, where did self control come from, where did the ability to delay gratification come from so that we could get long-term goals, for millennia it really wasn’t about maxing out your 401(k) or completing the Whole 30 [diet]. Those things didn’t exist. What allowed you to be a success was to have good character — to be honest, to be fair, to pay back your debts, to be reliable. That all requires you to cooperate with other people rather than be selfish. These were the emotions that underlie those. These emotions help us sacrifice to help other people. But we can pivot their power so they also make us willing to cooperate with someone who’s important to us, and that is our own future self. Knowledge@Wharton: People often work in teams in companies, so you need people to get along, show compassion to one another, have gratitude and pride for their success. DeSteno: A couple years ago, Google’s HR department … [was] trying to figure out which teams were most successful. And their prediction going in was technical expertise [would be the key attribute for success]. But what they found is that the teams that actually had the most success … had a culture of empathy and compassion for each other. … It’s very rare that one person has all the skills. And so they have to be willing to support each other, to help each other, and it was a big determinate in success. Work by Wharton [professor] Adam Grant on these emotions shows the same thing. He did work with Francesca Gino [and] they looked at people who were working in call centers. … What they found is that when the managers actually showed gratitude for these people’s work, their efforts at trying to garner money — it was a development office for fundraising — doubled. And similar work Adam did with Amy Wrzesniewski at Yale School of Management showed that anticipating pride in your success, and having a culture where the managers reward that, also increases people’s productivity, but it also increases their resilience and lowers their stress. Knowledge@Wharton: You bring up in the book that these types of emotions can also fight against loneliness. How does that work? DeSteno: It’s one of the plagues of modern-day life. From 1985 until now, the percentage of people who said they had at least one good friend that they could rely on dropped. … These days, 53% of Americans report that they feel lonely at work. We know from lots of research that loneliness is as bad for you psychologically as smoking is physically, that it will take years off your life. What these emotions do, because their origins are in social relationships, when you’re feeling them and experiencing them regularly and stoking a culture of them as a manager, they reinforce people’s social relationships. So yes, they make you more willing to persevere in the face of challenges, but they also make you willing to act in ways that draw others to you so that when you fail, when you have those bumps in the road, you’re in a better place because you have the social capital to support you. Knowledge@Wharton: If you don’t have that connection in the workplace, that carries over to your personal life, and then you’re probably running into health issues. DeSteno: You are right. It’s not only long-term health, it’s even health within daily life. There’s great work by Wharton looking at another kind of high-stress workplace, which are nursing homes and caregiving homes. They found that on floors characterized by teams that had a lot more empathy and compassion for each other, not only did the anxiety and the stress go down, but things like absenteeism went down. Cultivating these emotions not only helps your employees and individuals feel better, but it increases the bottom line as well. That could be a really powerful thing. That’s why you’re seeing a lot of businesses initially starting in Silicon Valley but now moving out more widely, trying to cultivate these virtues in their workforce. Knowledge@Wharton: Isn’t it a bit of a cultural push? We have more millennials in the workforce than ever before, and these traits are often linked to them. DeSteno: Yes, there’s a hunger in millennials for that. Sarah Conrath is a psychologist who studied this, and rates of empathy and compassion have been falling over the past 30 years. In some ways, that’s [the situation] millennials are coming into it now. They’re saying, “Wait, this is not right. We’re missing something in life here. Everybody is focused so much on their individual goals and trying to succeed in that rat race that we’re losing this care for others.” That’s part of the argument in this book. People say to me, “Should I be a nice guy or should I be a jerk to be successful?” I say, “What’s your time frame?” In the short term, if you want to be a jerk, if you take credit for other people and exploit them, you’re going to rise pretty quickly. But it’s going to be very short-lived. All the models we know show that the people who do the best are the people willing to share credit, to cooperate. If you want balanced, long-term success, inculcating these emotions in your teams and in yourself not only will give you grit, but it will give you that social capital to help you succeed. My goal in writing this book is to try and get people to move away from this very atomistic kind of route to success — where we’re just focusing on our ourselves, suppressing our emotional sides, nose to the grindstone, going ahead — because that will burn you out. Knowledge@Wharton: Let’s talk about pride, which has always been part of workplace culture. Take pride in the job you do. How does that adapt in this new culture? DeSteno: Pride often gets a bad rap. We tend to think of people who are egotistic, hubristic and arrogant. But this kind of traditional sense of pride in the workplace is exactly right, it’s taking pride in your work. It means you’re willing to work hard to do something that other people are going to recognize as valuable and superior. Where does pride fit in with gratitude and compassion? All of these emotions are ways that make you valuable to other people. If you show gratitude, people know you’re going to pay back your debts; you can be trusted. If you show compassion and empathy, they know you’re going to invest in them. If you show pride in your work, it’s a marker that you’re doing something that other people value and you’re a valuable part of their team. Knowledge@Wharton: How does mindfulness play into these qualities, especially with children and teens? DeSteno: If you read The Atlantic or The New York Times they’ll tell you mindfulness will lower your blood pressure, increase your creativity. It does all of those things, but if you look back at its origins and talk to monks, they will tell you the reason meditation and mindfulness were created was to foster a deep sense of compassion for other people and to foster ethical behavior. A friend of mine who’s a high-ranking monk told me that when monks first take their vows and start trying to be chaste and not drink and not gamble, they fail a lot like everybody else because they’re relying on willpower. But once that compassion is released, suddenly it becomes easier. Suddenly, the temptations go away and what matters is doing something that’s going to bring long-term good to yourself and others. I think mindfulness is an important thing in schools because not only does it help kids with emotion regulation, but it also fosters kindness and compassion. And that lowers stress in the classroom, especially in the teenage and adolescent years. Knowledge@Wharton: How does this type of mindset change business leaders, whether they be mid-level managers or executives? DeSteno: It affects everybody in the same way in that it makes them willing to value the future more. The more power you have, the higher up in the company, the more direction you can set. I think one big problem in business these days is shortsightedness. Everybody’s worried about what the next quarter is going to look like, and there’s not as much room for long-term thinking and planning, which ultimately is going to lead to success. Hopefully, it changes people’s views in that way. Most people know Walter Mischel’s famous marshmallow test, where he would put a marshmallow in front of a child and say, “You can eat this now, but if you can wait 15 minutes until I come back, you can have two.” What he’s contrasting there is the desire for the short-term reward versus the long term. He found that the kids who could wait had better success. Since then, self-control has been tied to lower credit card debt, lower addictive behaviors, all of these things. With adults, we do these experiments with cash. Would you rather have small amounts of cash now or larger amounts of cash later? We find that if we make people feel grateful, their patience for that long-term reward goes up. They’re much more able to resist taking an immediate bonus now and wait for long-term gain. They’re more willing to invest their money, they’re more willing to work hard. We can see that these emotions just change what you value. To the extent that they do that to CEOs, it’s going to hopefully foster more long-term outlook and planning in the company. Knowledge@Wharton: Do you think these emotions could truly shift our culture and business communities? DeSteno: It can shift not only our day-to-day working culture and make it a much more cooperative, less anxiety-provoking, less competitive environment for people who are working in teams. And I think that will actually lower people’s stress and increase their well-being. But it can also make a shift in what we’re doing. Right now, American society seems very focused on the here and now. What can I do in the moment? Infrastructure is crumbling. Debts are going up. I think we need to be a bit more long-term focused, and that requires some sacrifices in the moment. But the beauty of these emotions is you might say, “I’m willing to accept this sacrifice, to pay more for clean energy or pay more for building roads and infrastructure.” But if my buddy’s cheating on his taxes or over-running his lights and air conditioner, then I’m basically a sucker, right? He’s free-riding off of my efforts. The beauty of these emotions is not only do they make individuals more willing to accept sacrifices, but they make them believe that other people are, too. They solve that free-rider problem. As long as everybody is beginning to feel these, then everybody is going to be willing to sacrifice and see good in other people and expect them to do the same and make us more willing to have a long-term view on what’s important in society. The beauty of these emotions is you don’t have to think about it. When you’re feeling it, they push you to do the right thing. They push you to be noble. They push you to work hard. They push you to cooperate. If we can change enough of our culture to have these virtues, then I think we’re going to make a big shift. It’s never going to be perfect, but our goal is to increase our level of cooperativeness and virtue as much as we can.